Laura Becker, Ironman Lake Placid Finisher! July 27th will be a day I will never forget. I trained hard and stayed focused for a year to get to that day. I wanted to enjoy the day, feel strong, and keep smiling. That I did. A year ago I came up to Ironman Lake Placid to spectate. It was an amazing experience. When I was up here I could barely bike one loop. I had done a few sprints and one Olympic distance. I am proud of the changes I have made, and continue to want to strive for more. So here is my report from my first Ironman. Thursday morning I was up and out the door. Nervous, but very excited to get to Lake Placid. The drive was beautiful, I was jamming out to tunes just so excited to get there (people probably looked at me like I was nuts!!). Arrived to Art Devlin’s and tried to check in- it was too early, but standing outside was my good friend Darcy and her husband! What were the chances! I chatted with them and we reminisced about my journey from when I knew them. It was a nice time to chat. By that time, room was ready and I was ready to get my recon ride in! I was excited because Antoinette was arriving and we were going to ride together. Loved our time together being roommates at camp, and it just felt right to do our last ride before IM together. Hopped on the bike and….click click click….gears were making funny noises. UGH!! Would just stop by tech tent when I got back but still got my nerves up since I had been having so many issues with my bike since Quassy leading up to LP. Finished the decent and right at the bottom was Matt and Arun from LP camp!! Was so great to see them! Again- what are the chances!! Got back to town and went to bike tent. Mechanic heard the noises and did some on the spot adjustments. Then it was off to the team dinner! What a GREAT NIGHT! It was so great to see the team and have a chance to chat. We talked tri, real life, and just simply enjoyed each others company. I even worked through some last minute details. Thank you Grant for helping me out on the run plan…worked perfectly!! Anyways, I don’t think I have laughed that hard in a while! Up early and to the lake for a loop. Felt great! Water was beautiful and time was on track. Then to 4 Keys talk, which helped me stay in my box and get me focused to follow my plan. Went to registration and checked into condo. Bike check in/gear check in. Does anyone else have trouble leaving their gear behind? Just don’t like it. My bike lives in my house lol Went home- feet up! Did not feel hungry when I woke up, almost felt full. L Not happy about that! I didn’t eat too late, not sure what happened. But either way, it happened. Still ate my breakfast on time and got ready to go. Felt good. Excited to start the day! Team EN picture and off to the lake. Here is where the nerves kicked in. the chute was VERY crowded. I was trying to get to the end of the 1:00-1:09 group and I was having trouble. Everyone trying to push through. Note to self- get into the chute earlier! I finally made it. Off and into the water. Started to get my rhythm and stuck to my plan. Away from the line, find open water, enjoy the swim. First lap 35 minutes. Second lap, started to rain, got a bit crowded at parts, always looking for open water and kept it going. I added some distance by swimming around people and getting into open water, but I knew that might be the case (2.56 miles). Rain started, but just tried to ignore it and keep it steady. Finished and felt great! Running through the shoot trying to calm myself about the rain. It was coming down. Saw my amazing friends and family and just couldn’t stop smiling. Gear on, but then before leaving tent, stood there and mentally got myself ready as I heard the thunder and saw lightning. Asked myself- is this safe? Yup- I’m doing this!! Smiled to a volunteer and grabbed my bike. I was cold. It was cold, raining, windy, lightning. I GU’d before mounting the bike (not in my plan) but thought it would be easier than trying to get the first GU in the DOWN POURING rain. I saw my family as I mounted my bike and the cheering and smiles just made me forget the elements. I have Reynaud’s, which is a circulation issue in hands/feet, and I had already lost feeling in my hands. I was shivering, but kept telling myself, that it’s only rain, I’ll be fine. On the climb out of down I did some self talk to make sure I was ready for the descent. After my crash at Quassy I have been more nervous with descents. When I rode it on Thursday it was great, didn’t touch the breaks. Today I told myself to “Stay loose, focus on the road, feather brakes”. I did NOT want to go screaming down that descent in the pouring rain as I was shivering. Made it to the bottom. Staying in my box, I just kept thinking, it will warm up soon. I tried to smile and remind myself that this is part of my journey and I just need to execute my plan. My muscles were tight, which I assume was due to the cold. I saw John out there, which was awesome. Just to say HI to someone I knew, knowing that yes, this was crappy weather, but we were still out there doing our best! I was staying on point with my nutrition, drinking and eating. When the rain stopped, I felt like a new person!!! New burst of energy and pure joy. Reminded myself STAY IN MY BOX. Climbing back into town….spin up the hills PUSH DOWN. I tried to make sure to take it easy on the first loop. Stopped at special needs and continued onto the second loop. Second loop felt good. My piriformis started tightening up for the last 20 miles, but just continued to stretch and carry on. Just annoying. Overall I was very pleased with the bike, I felt like I executed according to plan and was ready to run. 11 minutes (again!!) There is a reason- I had to wrap my foot for the run, and that takes a couple minutes. Was absolutely worth it because I had NO foot pain!! 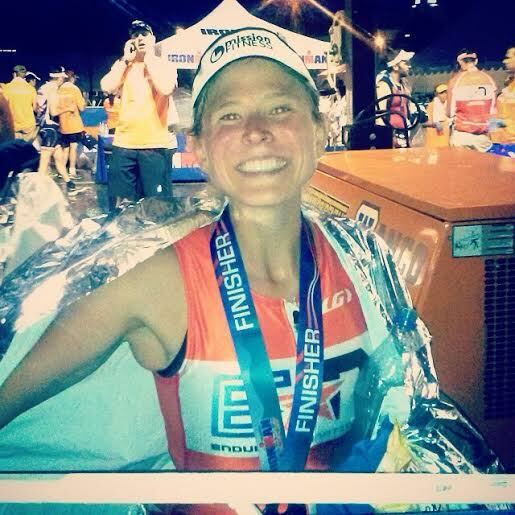 I have learned many things from this journey and I cannot wait to complete my next Ironman!!! I have to say that seeing my family, friends, Coach P and EN teammates cheering and out on the course made all the difference in the world. There are not enough words to express how thankful I am for all the support. The kiss from my husband, the screaming MANGOOO from Evan, the hug from Brenda, the “I’m proud of you” from Simon, the “Lauraaaa” from Steve (who was really telling me to stop walking and run), the it’s ok we made it down the decent chat with John, the GO Laura from Michelle, the “you look strong” from Chris, seeing my roomie Antoinette, the “go get em” from Heidi, the smile from Natalie, the nod from Grant, the tears of joy from my friend Melissa (who I had to tell stop crying), the smile on my mother’s face and SO many more moments from my day that I will never forget. I will be forever grateful to each and every one of these people, those who I knew, and those complete strangers, who helped me through my journey to become an Ironman.